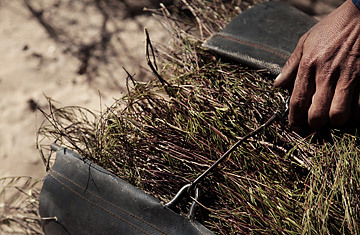 A farm worker harvesting rooibos tea at the Elandsberg Eco Tourism fields in Clanwilliam, South Africa on Feb. 13, 2012. Farmers fear that climate change could destroy the delicate eco-system that their crops depend on. Temps Plunge Across Europe: Climate Change? The climate war  the public opinion battle between skeptics of man-made global warming and those who believe in the scientific consensus  escalated to a new level of ferocity this past month. First a series of memos allegedly from the Heartland Institute  a libertarian think tank that has long supported climate skepticism  surfaced on the Internet, detailing the group's previously anonymous corporate funding and outlining its plan to fight action on global warming. Then came the news last week that the Heartland memos had been fraudulently acquired by the environmental advocate and scientist Peter Gleick, who  after allegedly being sent an initial memo by a person he identified as a Heartland insider  impersonated as a Heartland board member via email in order to obtain several additional internal documents. Worse, Heartland now claims one of the memos was doctored  while nonetheless confirming that it plans to push global warming skepticism in the nation's schools, opening up one more, very impressionable front in the seemingly endless climate war. If there's anyone who knows how nasty the climate fight can be, it's Penn State climatologist Michael Mann. Mann, who has been involved with the U.N.'s Intergovernmental Panel on Climate Change (IPCC) for over a decade, gets regular death threats at his office. He's been the target of a lengthy  and, critics say, politically motivated  investigation by the attorney general of Virginia. His private emails to colleagues have been hacked and published, and he's become a major public target for Heartland and like-minded groups. "I guess over the years I've experienced quite a few adventures," says Mann, who is about to publish book on his experiences, called The Hockey Stick and the Climate Wars: Dispatches from the Front Lines. "It's given me not just a solid understanding of the problem of man-made climate change, but also the campaign  largely funded by the fossil fuel industry  to deny that science." The "hockey stick" in the book's title refers to a graph that Mann put together in the late 1990s  and which would earn him the eternal enmity of climate skeptics. Reliable temperature records only go back about 150 years, which obviously poses a problem to scientists trying to figure out if the warming seen recently is historically unusual. So Mann and his colleagues used data from physical proxies like tree rings  which generally grow wider during warm years and narrower during cold ones  to reconstruct global temperatures over the past 1,000 years. He found that temperature remained relatively steady over the past millennia until it began to zoom upwards around 1950  the same moment that man-made greenhouse gas emissions began to spike as well. Plotted over a graph, the data resembles a hockey stick lying on its edge, with the sharp, upward inclined blade representing the past half-century of warming. Mann's work became part of the IPCC's Third Assessment Report in 2001, and found its way into popular works like Al Gore's An Inconvenient Truth. It became perhaps the most prominent symbol of climate science, a representation that could been seen and understood by anyone, even if the work behind it was complex  and sometimes challenged by other climate scientists. Maybe that was the reason Mann himself became an unusually personal target of climate skeptics who were seeking to pick apart the scientific consensus on climate change. He was mentioned repeatedly  and negatively  on Fox News and on climate skeptic blogs. There was a steady flow of angry letters, emails and calls. "There was just bewilderment that this was happening," says Mann, who had no idea how to respond to the attacks. "They were trying to isolate and attack me." The nadir came in 2010, after unknown hackers stole and published thousands of emails going back years from Mann and other climate scientists. Mann didn't always come off well, appearing dismissive of critics and climate skeptics. Taken out of context, a few of the emails seemed to indicate that Mann was adjusting his data to better fit the man-made global warming argument. Penn State and the National Science Foundation launched inquiries into his work, while the Republican Senator James Inhofe  a longtime climate skeptic  called from the floor of the Senate for a criminal investigation of Mann. Ken Cuccinelli, the Republican attorney general of Virginia, began a long investigation to find out whether Mann  who worked for the state-run University of Virginia in the past  has misused public funds. Mann had legitimate fears for the future of his career  and for more than that. "I was at the receiving end of death threats and thinly veiled threats to the safety of myself and my family," says Mann. "That took its toll personally." In the end, Mann was exonerated by every academic inquiry that looked into his work, while the Virginia investigation has gone nowhere. His professional colleagues have rallied around him and his work. But while Mann emerged from the crisis with his career mostly unscathed, the experience convinced him that he and other climate scientists were in a fight with well-funded climate skeptics, and that his side had to step up their game. "They're street fighters and we're Cub Scouts," says Mann. "The Cub Scouts are going to lose this fight if we don't become more wily." For Mann, that's meant stepping "beyond the lab door," as he puts it, and taking the case for climate science to the public. But the Heartland affair shows how difficult it's going to be for scientists to win a PR war against skeptics. Scientists are held  and hold themselves to  a higher standard than political groups like the Heartland Institute. That's one of the reasons scientists are trusted by a larger share of the public than most other authority figures  especially politicians. But that trust is fragile, and if scientists stoop to some of the same tactics the other side employs  as Gleick did against Heartland  they risk winning a battle at the cost of losing the climate war. As the British climatologist Richard Betts tweeted yesterday: "If people don't trust climate scientists then all the activism counts for nothing." Mann realizes that as long as he keeps conducting climate research, he'll be a target for tough personal attacks. "I fully recognize that this is going to continue for the rest of my life," he says. "And probably beyond." He's all right with that now, even though he knows that his side will always be fighting the climate war at least partially  and voluntarily  disarmed. "We can't maintain the moral high ground if we adopt street fighting tactics ourselves," says Mann. "We feel that we can and will win an honest debate." As much as Mann wants to be a climate warrior, that's really the only way he knows how to fight.